When welcoming hugs lead to lingering embraces you know a spark of romance is growing into a burning fire. 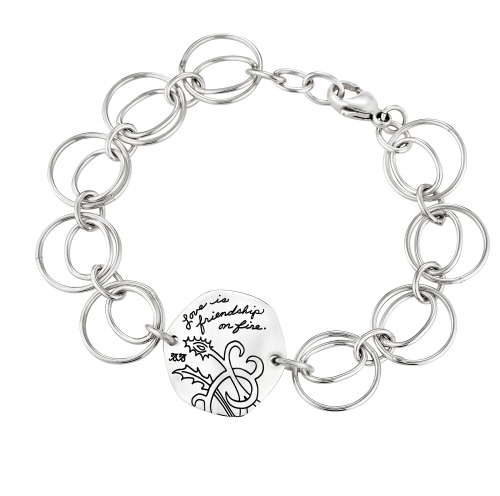 Celebrate your blossoming love with this meaningful sterling silver bracelet. Each carefully paired set of links includes a small circle signifying friendship and a large circle signifying love. They all lead to a shining sterling silver token featuring Jo Becker’s classic handwriting and her artistic rendering of blooming plants. There’s nothing more beautiful than love in bloom. The quote, “Love is friendship on fire,” originated with a poem from the 1600s. Laura Hendricks included it in the poem below, which has become an immensely popular wedding reading. Due to the quote’s popularity in vows, this bracelet makes a fantastic engagement gift or wedding gift.